Want to whip up an easy + healthy dessert? 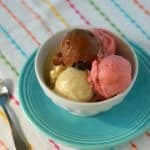 Make Vanilla, Strawberry or Double Chocolate Nice Ice Cream (Banana Ice Cream) using bananas as the base. There are tons of recipes for Nice Cream (Nana Cream, Banana Ice Cream …) in the universe, but these are my go-to recipes. You can definitely add to these base flavors on your own, or make easy substitutions: swapping frozen raspberries or blueberries for the strawberries, using a chai protein powder or raw cacao instead of cocoa powder, etc. I’m sharing the basics, along with my tips for nice cream success and some recommendations for nabbing vanilla bean paste and allergen-free chocolate chips. Peel the bananas before slicing: I thought this was obvious, but one of my readers emailed me to assure me it wasn’t! Freeze slices in a single layer: pop the sliced bananas in a large freezer bag, and spread them out while they are freezing so they don’t clump together. Alternatively, freeze the slices on a lined sheet pan, and then put them in a zip bag once they’re frozen. If you’d like a non-dairy ice cream recipe that isn’t nice cream, check out this Coconut Chocolate Chip Ice Cream! Put the ingredients in the bowl of a food processor or pitcher of a high-powered blender and process on high, occasionally stopping to scrape down the sides. The mixture will look crumbly, then gooey, then (finally!) creamy, like soft serve. Serve right away or freeze in a sealed container for up to 1 week. If you’d like the nice cream a little firmer, a 30-45 minute chill in the freezer should do the trick. This entry was posted in Dairy Free, Desserts, Kid Zone, Paleo Friendly, Recipes, Vegan and tagged autism diet, autism gluten free, celiac disease, chocolate, dairy free, dessert, g-free, g-free diet, G-Free Foodie, gluten free, gluten free cooking, gluten free food, gluten free snacks, kc cornwell, vegan. Bookmark the permalink.